What was needed was a spell-checker for accessibility, an ‘access-checker’, that would pick up any issues in the source document which might convert incorrectly or incompletely. At CSUN NetCentric announced the beta version of PAW (PDF Accessibility Wizard) for MS Word that provides exactly this function. PAW is an add-in to Microsoft Office Word 2007. 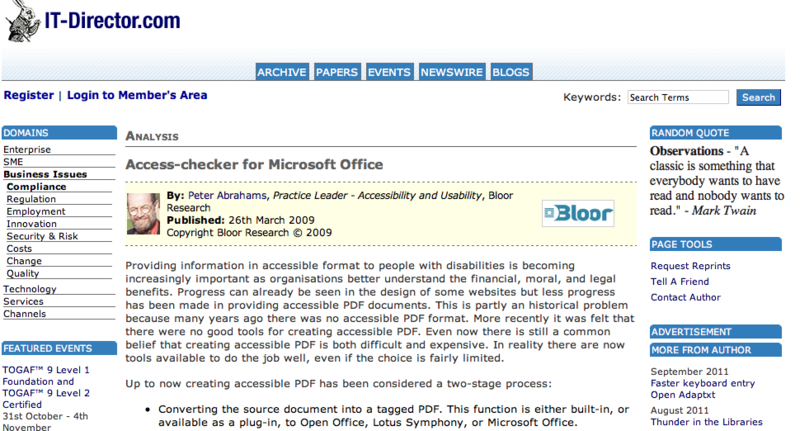 The checks and tests are started by a ‘save to accessible PDF’ command. This command runs all the checks, issues any prompts for additional information, and then creates the final accessible PDF file. For example if the author has inserted a table into the document PAW will prompt for a description of the table and information about column and row headings. Where the information can be added to the source Word document this will be updated, in the case of information which cannot be added to the source (such as table row headers) then this will be noted separately and reused if the save command is repeated on the same file. The access-checker will reduce the number of iterations between the author and the editor hence reducing the overall development time and the total cost. The lack of prerequisite software will also reduce the total cost of a Word to accessible PDF solution. Bloor Research believes that it should pay for itself very rapidly in reduced staff and software costs.